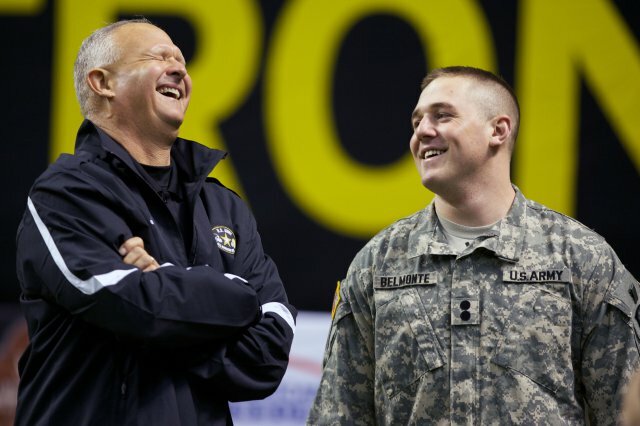 Rockne Belmonte, an Army Cadet and kicker for Northern Michigan, shares a laugh with Tim Teykl, head coach of B.F. Terry (N.J.) High School, before they filmed a piece for NBC on Wednesday at the Alamodome in San Antonio. NBC will air the U.S. Army All-American Bowl, a high school all-star game, from the Alamodome on Saturday. Most professional football dreams aren’t routed through Army ROTC. They’re definitely not routed through a dome made of wood on the shore of Lake Superior. And they rarely come with a soundtrack that includes the 1984 heavy-metal mega-hit “Rock You Like a Hurricane” by German import the Scorpions. But kicker Rockne Belmonte — yes, his dad went to Notre Dame — is the exception. A ROTC cadet, Belmonte graduated from Northern Michigan in January after a senior season that included two field goals of 55 or more yards. A 58-yard bomb Oct. 13 against Grand Valley State — kicked inside the Superior Dome, the world’s largest wooden dome structure — set a school record. He just has to work on consistency, going 14-of-20 on the season. He’s received some interest from indoor-football teams, he said in a recent Army news release, and plans to attend Arena Football League and NFL tryout camps to show off his range. He hopes to transfer into the Army Reserve so he can pursue a pro career. Sure, it’s not the resume of a top-tier college kicker, but only two Football Bowl Subdivision kickers made field goals of more than 60 yards this year. You can’t teach leg strength, and a successful stint indoors — with narrower uprights — could open some eyes at the NFL level.